Randy Stange looks forward to the future, building programs and facilities. 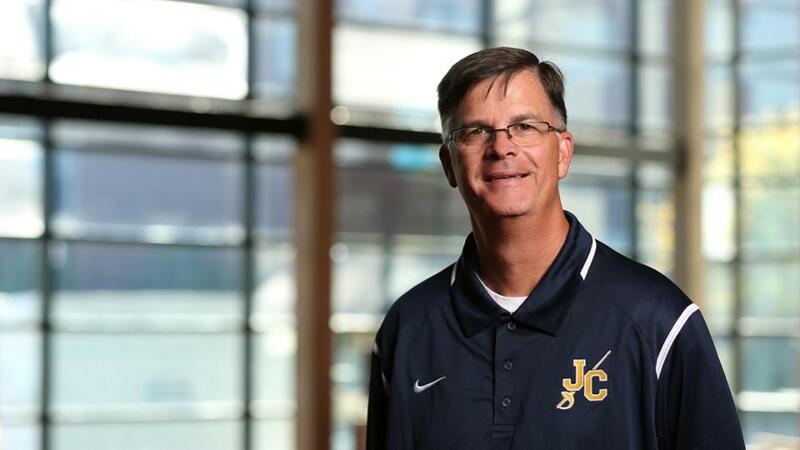 Bringing 30 years of experience in athletics, Randy Stange takes the helm as the sixth director of Johnson County Community College’s Athletic Department. Stange said he’s looking forward to changes soon to come to the JCCC’s athletic facilities, and he’s excited to involve the community in the College’s athletics. Stange was named the 2013 National Association of Collegiate Directors of Athletics’ Under Armour Athletic Director of the Year for NJCAA Division I. In that same year, he also received the NJCAA Service Award. At the time, he was the athletic director at Hutchinson Community College. He will oversee JCCC’s seven-team intercollegiate athletic program and the athletics division staff. Only five athletic directors have had a hand in leading the department, including Carl Heinrich, who recently retired after 26 years. During JCCC's storied history, the Cavaliers have earned 11 NJCAA Championships and 21 runner-up national finishes. Stange has played all the parts: player, coach and athletic administrator. A native of Nickerson, Kansas, Stange had a sterling high school basketball career and was named to his All-Conference second team. He went on to play basketball for Hutchinson Community College (HCC) and then transferred to Missouri State University, where he is still ranked second in free-throw accuracy at .855 at the line. He was inducted into MSU’s Hall of Fame in 2001. After graduating in 1986 from Missouri State with a bachelor’s degree in recreation, Stange landed an assistant basketball coaching position at Kansas State University under Lon Kruger during the 1986-87 season. Staff positions at Missouri State University and St. Louis University followed, as well as a master’s degree in sports administration. Most recently, Stange was athletic director for Springfield, Missouri, public schools. Prior to that, Stange served 18 years as athletic director at his alma mater, Hutchinson Community College. He played a major role in the renovation of Gowans Stadium, an experience he said will help him as JCCC moves forward with a campus facilities master plan. Around $1.3 million has been allocated to refit the gymnasium and its surrounding area. Estimated completion for the entire project is September 2018. Once completed, JCCC’s athletic facilities will be better positioned to host community events. The track facility will not be relocated, as the College will discontinue track and cross country programs in spring 2018. Stange said he’s doing a lot of listening to student athletes and coaches to learn what is valuable to them. Come over to campus and watch our winning teams take on community college rivals. Go to jccc.edu/cavs where you’ll find schedules for all of JCCC sports’ teams.